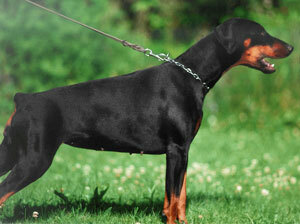 Biene von der Doberwache passed the Swedish Körung and was CAC at a Swedish Dobermann special Show. Her dam, Kleo von der Weyermühle, was a German Police dog who also won the working IDC World Championship in 1996 and her sire, Gero von der Mooreiche, was runner-up at the D.V. Meisterschaft in 1992 and 1996. Biene lived to 10 years of age and died from an accident while her sire lived to 12 years of age to and her dam lived to almost 13 years of age. Qampus: sire of Black Palma's “A” litter (Ali => IDC-Weltmeister in 2006). Winnie: IPO3, FPr2, MH and IDC-WM participant in 2009. She is dam of Briska's “A, D, Z” litters (Arcon, Zarek, Zarina). Wilma: IPO 3 and IDC-WM participant in 2006.